The WPA Exhibit is located on the 1st Floor of Campbell Library. Franklin D. Roosevelt’s New Deal included the Works Progress Administration. This program had a significant on the development of libraries in the United States. The WPA provided funding to build or renovate libraries on campuses and in many communities. Monies also supported staffing and material purchases. 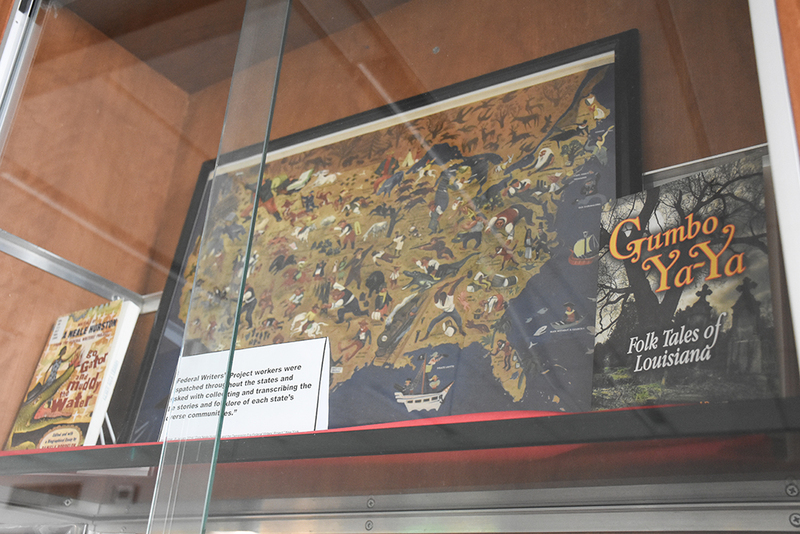 An exhibit honoring this project was curated by Interlibrary Loan Assistant Cynthia Holland and is located on the first floor of Campbell Library. Library and literacy outreach programs reached populations struggling during the Great Depression. Programs were designed for hospitals, playgrounds, and prisons. Library materials were delivered via sleigh, boat, book mobiles, and pack horse. The Kentucky Pack Horse Library Project is a prime example of dedication and creativity. Twice a month, librarians rode their own horses over routes of 100+ miles to deliver books in the Appalachian region of the state. The Works Progress Administration, remembered for building and infrastructure, was also a driver for learning and literacy. The Federal Writers’ Project, another WPA initiative, furthered the growth of literacy through publication of the American Guide Book series. Many famous authors got started writing for the guide books: Zora Neale Hurston, Ralph Ellison, Studs Terkel, Eudora Welty, and John Steinbeck to name just a few. The guide books also addressed the need for a shared national identity during the economic depression and pre-war international relations. The writers celebrated the cultures and vistas of each state as well as the stories of individuals. For example, writers for the WPA collected over 2,300 narratives from former slaves. These reflections and retellings became essential to documenting American history. Importantly, personal narratives and folklore of people from diverse backgrounds fostered an awareness of the rich variety of voices and people that make up the United States of America.